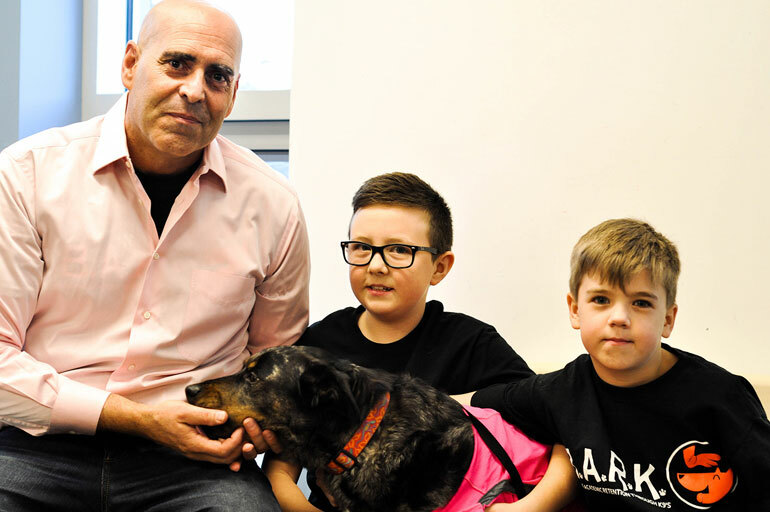 UBC Professor John-Tyler Binfet (left) is seen here with participants of a program he runs to help foster emotional well-being in students. As many Canadians recognize the need to identify and combat bullying on national “Pink Shirt Day” (Feb. 24), UBC Assist. Prof. of Education John-Tyler Binfet cautions that we need to be careful not to just focus on the negative. Binfet has researched the perceptions of school kindness for several years. For behaviour to truly change, and for school children to become empowered, he says we need to recognize and model traits such as compassion and empathy. 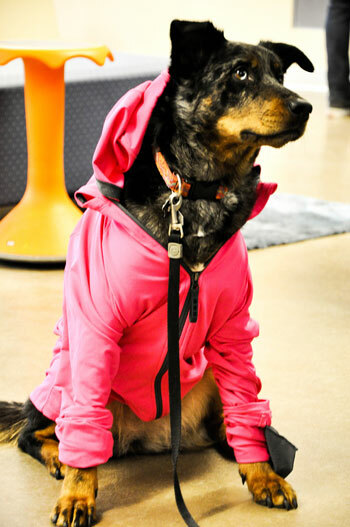 Binfet's dog, Frances, participates in UBC Okanagan's B.A.R.K. program, which helps foster emotional well-being in students. Bullying is a serious problem. Are you saying we actually need to stop focusing on bullying and turn our attention elsewhere? I think it is important to recognize bullying as undesirable and damaging, and I believe Pink Shirt Day has done a lot to bring attention to a serious problem. I’d like to see educators place more emphasis on the behaviours we want to see from students, such as kindness, rather than on the behaviours we want them to avoid. For change—real change that helps our children live in the world we want for them—the research is telling us that we need to identify, model and acknowledge traits such as compassion and empathy in our schools and in our homes. Where can we have the greatest impact for change when it comes to how children are treated and how they can learn how to treat one another? We have empirical evidence that tells us that students in kindergarten, who have strong social and emotional skills, become adolescents with strong social and emotional skills. And schools are well positioned to help facilitate this growth. Kindness happens in many ways that we don’t often see, and my research in classrooms throughout BC’s Okanagan Valley tells us that kindness can often go unnoticed. If we are going to prevent negative behaviours such as bullying from happening in the first place, I think we need to reorient out focus to see the kindness happening at all grade levels. What can parents, teachers and other role models do so that children and the people who work with them not only recognize kindness when they see it, but that they make sure that children understand the importance of it? It’s important for adults to recognize that students are very perceptive and notice small gestures and interactions that reflect kindness. Students aren’t looking for over-the-top big acts of kindness or big events but notice adults smiling, saying thank you, and supporting students as they go about their day. What other benefits can we expect by identifying and modeling acts of kindness, compassion and empathy? Acts of kindness contribute to a school’s climate, and positive school climates have been linked to a number of favourable outcomes for children. The evidence tells us that kindness promotes feelings of safety, helps children to establish and maintain healthy relationships, reduces misbehaviour, and can increase academic success in school.